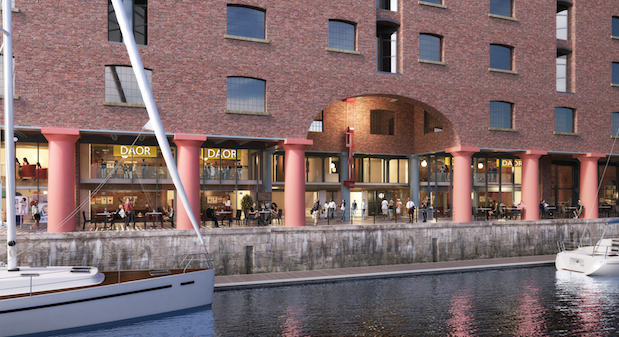 At an informal lunch held for key property and business media this week, Aberdeen Asset Management shared its vision for the future of Albert Dock’s evolving retail and leisure offer. As the most visited free tourist attraction in the North West, the docks welcomed 6.3m visitors in 2016. Designed by civil engineer Jesse Hartley and opened in 1846, Albert Dock represents the biggest cluster of Grade I-listed buildings in the UK and forms the centrepiece of Liverpool’s UNESCO world heritage waterfront. According to Aberdeen Asset Management, there is no better backdrop for the development of a prime retail and leisure destination. Richard Wilson, asset manager at Aberdeen Asset Management, said ahead of the lunch: “Albert Dock is a unique space and we have been working closely with our partners in Gower Street Estates since we acquired the commercial spaces in 2016. He continued: “We are really pleased with the direction of travel and will be introducing the scheme to planners and to the market in the next few weeks. At the lunch Gavin Tuck, creative director of design agency Small Back Room, presented the proposed new creative direction and vision for Albert Dock. The plans include enabling double-height retail units along The Colonnades. Sue Grindrod, Albert Dock Liverpool’s chief executive, said: “As the freeholders of Albert Dock, Gower Street Estates welcome the investment being made into the retail and leisure offer by Aberdeen Asset Management.